Beyond the solubility limit, every molten metal will be unable to dissolve any more of a particular gas. Furthermore, that solubility limit in the molten metal usually decreases with decreasing temperature, until at the melting point, upon solidification, the solubility drops abruptly. As the solubility for a gas decreases in a liquid metal upon cooling, it comes out of solution in the form of bubbles. These bubbles form near the boundaries of the weld pool where the molten weld metal is almost always the coolest. Once formed in the liquid, these bubbles attempt to rise in the weld pool since they are buoyant. However, because of this buoyancy, they are also subject to convection, and, so, are swept through the liquid in a direction that depends on the direction of convective flow. This direction, in turn, depends on the particular force that dominates the convection – a buoyancy (or gravity) force, a surface tension gradient force, an electromagnetic force, or an impinging or plasma friction force. If, for example, the surface tension gradient force dominates, molten metal in the weld pool will move outward from the center and downward near pool edges, sweeping any gas bubbles back down into the depths of the pool. If, on the other hand, electromagnetic forces dominate, molten metal will move from the pool edges to the weld center, at which point, upon colliding with fluid flowing in the opposite direction from the other side of the weld pool, it will turn downward, strike the bottom of the pool, and turn outward and upward along the pool edges. This action will sweep any gas bubbles forming near the pool edges up to the pool surface to escape. These different actions are shown schematically in below figure. Unfortunately, these gas bubbles never get to escape, regardless of the convection flow pattern. The reason is that solidification occurs first, trapping the bubbles to produce pores. Gas porosity, whether from nitrogen, oxygen, or hydrogen, is always problematic. First, it indicates that shielding was less than adequate, and that unwanted gas-metal reactions are occurring. Second, pores can easily act as stress risers, there by promoting brittle (over ductile) fracture and aggravating susceptibility to cyclic loading (fatigue). The fact that a pore can act to arrest a propagating crack by blunting it, and, thereby, reducing the stress at its tip, is not justification for accepting porosity, the third and most significant reason porosity are always problematic is that its presence indicates that the process is not under proper control. Reference: Principles of welding; Processes, Physics, Chemistry and Metallurgy; Robert W. Messler, Jr.
Smoothness of coating: if extrusion pressure is less or more than the specified then coating will have rough surface, it is termed as under pressure and over pressure in quality language. Visual after baking: after baking of electrode there may be possibility of cracking in coating, thus visual is carried out. And also sometimes there may be more shrinkage in coating as binder evaporates resulting in variation in surface finish and coating diameter. This is the most important quality check of electrode coating. This ensures uniform thickness of the coating around the core wire. In SMAW process, the coating crater, or the cup-like formation of the coating, that extends beyond the melting core wire, performs the functions of concentrating and directing the arc. 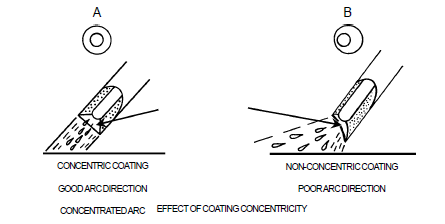 Concentration and direction of the arc stream is attained by having coating crater, somewhat similar to the nozzle on a water hose, directing the flow of weld metal. When the coating is not concentric to the core wire, it can cause the condition as show in fig B. The poor arc direction causes inconsistent weld beads, poor shielding, and lack of penetration. The electrode burns off unevenly, leaving a projection on the side where the coating is the heaviest.